Take a speedboat ride along San Francisco Bay! See sights like Pier 39, Alcatraz, Treasure Island, AT&T Park and the Bay Bridge on your 30-minute spin on the water, complete with awesome rock ‘n’ roll music and live narration from your friendly captain. This is the most fun and exciting way to see the Bay. This ticket allows you to skip the box office line and go straight to the gate. 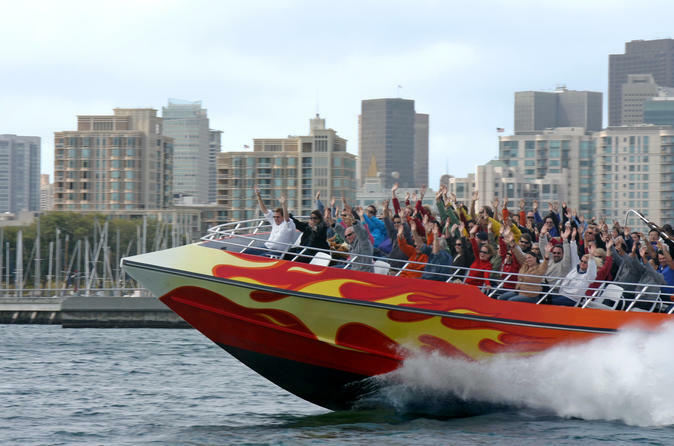 With your skip the line ticket, go straight to the gate for your exhilarating 30-minute speedboat ride along San Francisco Bay. Strap yourself into the 70-foot (21-meter) RocketBoat, the fastest and most nimble watercraft on San Francisco Bay. You’ll fly across the water at speeds of up to 55 mph (81 kph) under the steady hand of your friendly captain, who’ll entertain you with live narration about the sights you see. Pass the The Embarcadero, AT&T Park, Treasure Island, Alcatraz and sea lions, and travel under the Bay Bridge! You’ll stop occasionally to enjoy unique sightseeing from the water and capture photos of these San Francisco landmarks. Your exciting ride is paired with a great rock ‘n’ roll soundtrack. Be prepared to get wet if you sit toward the back of the boat; the front of the boat tends to stay drier. Complimentary ponchos are available upon request. Please note: This tour is seasonal and only runs May - Oct.